Elske, Danish for love, is a restaurant that fully encompasses the Nordic spirit of minimalism and comfort, with an emphasis on simple food done right. The second you you step into Elske -- located at the end of Randolph Street's Restaurant Row -- you are warmly met with a cozy patio and roaring fireplace, providing the sensation that you've entered a friend's home. 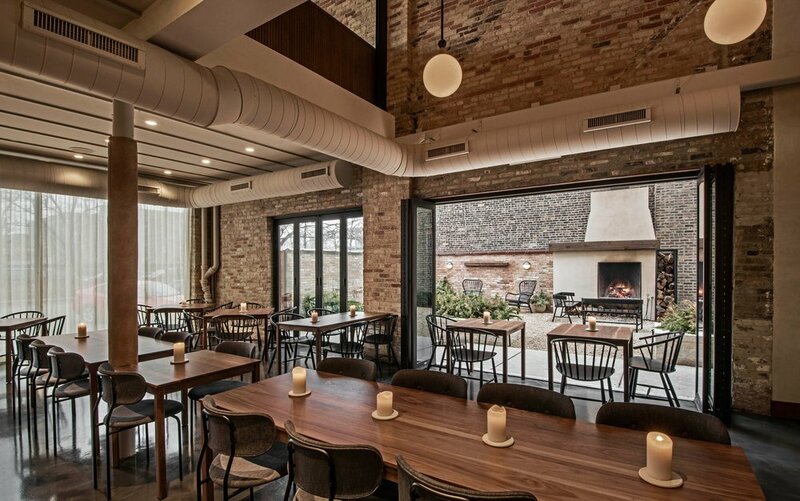 The dining room is softly lit with open access to the kitchen, where chefs David and Anna Posey work harmoniously and meticulously to bring a piece of Scandinavian culture to the West Loop. David Posey, two-time James Beard Award Rising Star nominee and former chef de cuisine at Blackbird, and Anna Posey, former pastry chef at The Publican, combine their culinary talents to create a contemporary Danish dining experience worth a visit. Elske offers the option of either ordering a prix fixe menu or à la carte, both featuring a wide variety of dishes that highlight seasonal ingredients. On a cold night in late November, grilled autumn squash with pumpkin seed praline, roasted leg of venison, and cold-smoked fjord trout highlighted the autumnal ingredients prepared with a range of cooking techniques used in the restaurant. 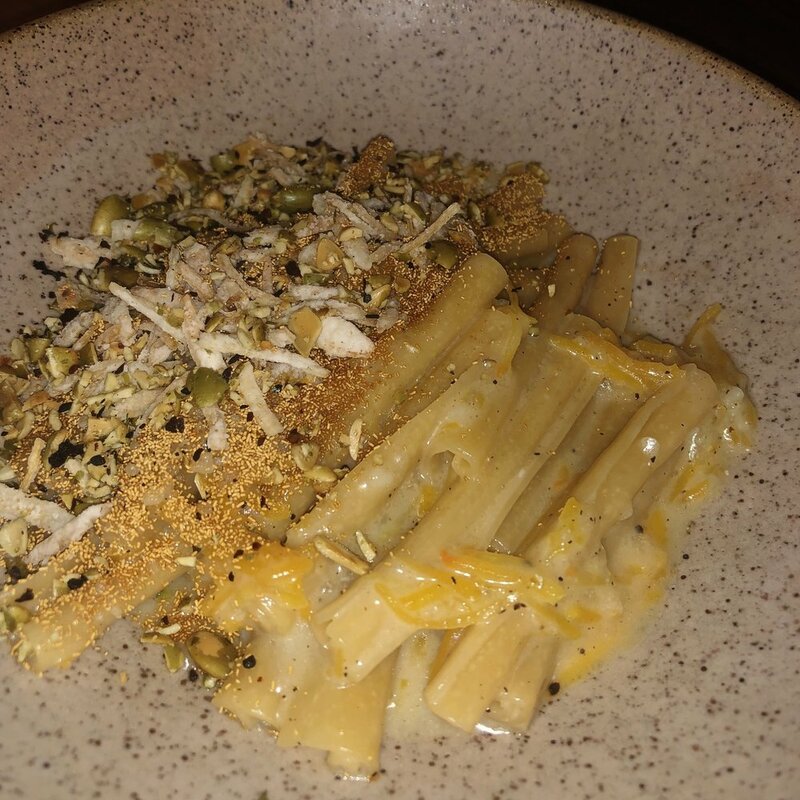 The staff was incredibly friendly and knowledgeable about the respective dishes. With one dairy allergy in our party, the kitchen immediately offered to adapt a variety of dishes on their menu to prepare them without dairy, or dairy on the side, when possible. We opted for ordering family-style off of the à la carte menu, deciding on Publican dark-rye with koji cultured butter, smoked fjord trout with beets and oxalis, grilled octopus with ground cherries and spice tofu, yeasted rigatoni with corn and pecorino, soft scrambled eggs with mushroom-braised kale and confit maitakes, pork and snail sausage with roasted onion and concord grape, and confit chicken wings with turnips and lemon balm. Our meal began with a warm loaf of Publican dark rye with tangy koji butter and sharp Spanish olive oil with sea salt. Publican Quality Bread supplies over 50 restaurants across Chicago for good reason -- the dark rye had a thick, yet incredibly crisp crust and soft interior that--paired with the cultured koji butter--served as an incredibly elevated take on the classic bread and butter. For the second course, thin cuts of pickled beets were elegantly layered on top of cuts of smoked fjord trout, delivering a complimentary briny flavor to cut the richness of the smoked fish. Golden honey brought a subtle sweetness to the dish, while toasted buckwheat provided a much needed textural component that ultimately made this dish a table favorite. 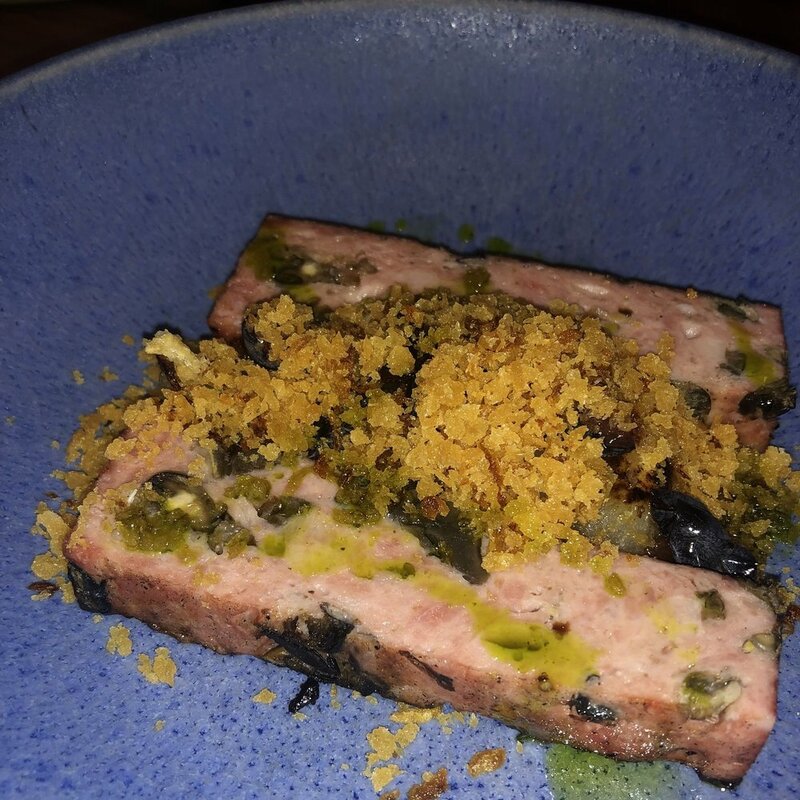 Another favorite was the pork and snail sausage with roasted onion and concord grapes -- the coarse-ground housemade sausage itself was incredibly succulent and had a rich mouthfeel, while the complementary deep herbal notes gave the pork and snail a full-bodied depth of flavor. Essentially, it was everything we could have ever wanted in a sausage. The one dish our table did not particularly enjoy was the grilled octopus; while the octopus was cooked well and texturally pleasant, the intense smokiness from the tofu paired with the smokiness of the octopus overwhelmed our palettes. The dish was largely one note, and we felt as if smoke was the only detectable flavor throughout the dish. For dessert, we ordered poached quince with fig wood ice cream and meringue with parsnip-coconut ‘whipped cream’ and apples. Anna Posey herself served us the two desserts, leaning over to passionately explain the dishes with a wide smile. We made a point to leave room for dessert, and I am so thankful we did. 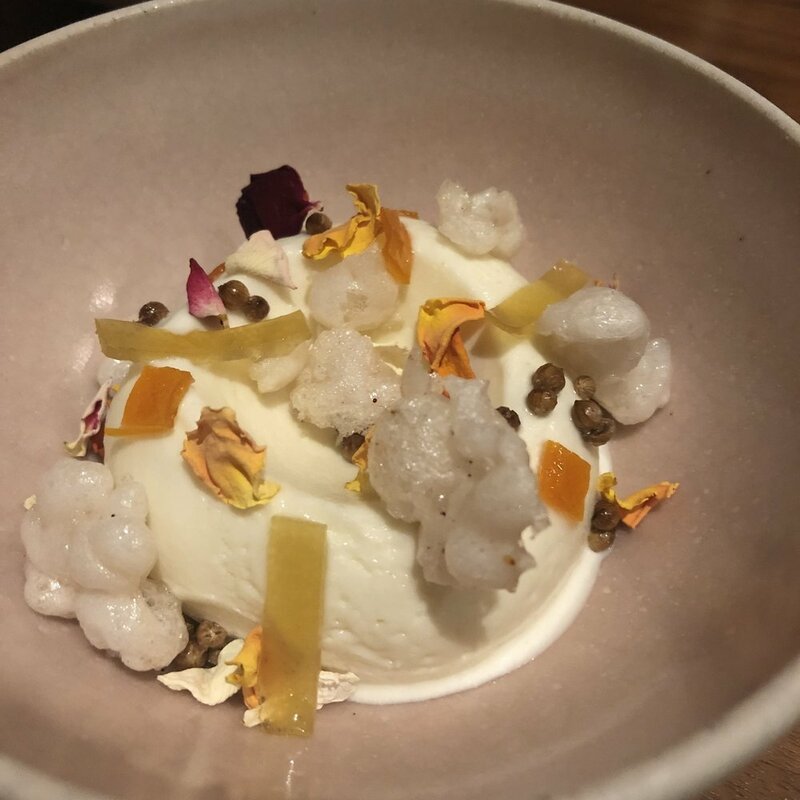 The rich fig wood ice cream was artistically decorated with candied coriander, dried rose, citrus peel, and puffed tapioca, while the poached quince was sliced and served in its sweet poaching liquid on the side. The two paired beautifully together as the delicate floral notes and subtly sweet quince elevated the ice cream. Breaking into the large meringue shell was a treat in and of itself, but the rich parsnip coconut cream filling dotted with cooked apples was the sweet ending to a fantastic dinner. Sugared breadcrumbs (as they contained dairy) were served on the side, and provided a salty-sweet contrast to the creamy dessert. If you have yet to visit Elske, this is an appeal for you to go. Maybe you will see me there.